Epicor Mattec Manufacturing Execution System (MES) was built with IoT in mind. Epicor MES collects data directly from equipment and operators on the shop floor in real time, minimising inaccurate and time-consuming manual data collection. This valuable insight allows you to be proactive and make better decisions, such as decreasing machine downtime, and anticipating and solving production problems before they happen. Production Monitoring: Capture data directly from machines and operators and get real-time, consistent production metrics and analytics in an easy-to-digest, visual manner. Process Monitoring: Get real-time views of process parameters, as each part is being produced. Identify problems and send alerts, trigger alarms, or even automatically shut down a machine. Energy Monitoring: Analyse load patterns, production requirements and resource demands, to capture energy savings. By keeping an eye on energy performance indicators (EPIs), you can reduce consumption and cut costs. Alerts and Notification: With automatic message routing and escalation, supervisors, maintenance crews and engineers can immediately react to conditions and keep production on track. Production Scheduling: For your company to reliably deliver on its commitments, you need real-time visual production scheduling that keeps constant pace with what’s happening on the shop floor. 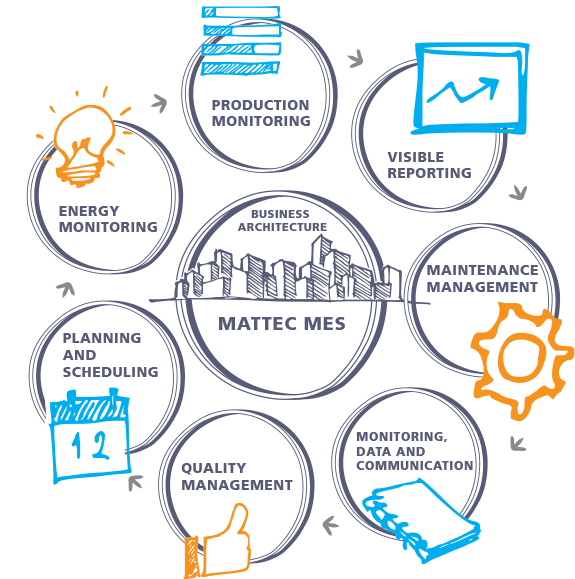 Maintenance Management: With a proactive approach to maintenance, repair, and overhaul (MRO) – where you control activities for machines, tools, and auxiliary equipment based on actual runtime, number of cycles or time – you eliminate guesswork and conflicts from your maintenance programme and improve throughput. Quality Management: Statistical process control (SPC) and statistical quality control (SQC) use real-time, automatic data to help you respond to production conditions, assisting to improve quality and reduce costly scrap and rework. Advanced Analytics: This click-to-explore vehicle brings operations data to life, helping managers and executives establish priorities and determine what needs work and who needs help – in one plant or many.